Ideal #OOTD: Lace sweater & coloured skinny jeans. Life has been more than a little busy with our recent family vacation & wedding in the family, plus my little lady’s 3rd birthday party. Needless to say, my blog has been ever so slightly neglected a wee bit in the last couple weeks. I put this outfit together during my vacation, when we had one particularly breezy day on the beach. I love it so much, I wore it again to the office the week we got home. I have long coveted a pair of skinny jeans in my oh-so favourite colour and I may have a minor fetish for sweaters with lace details. When I spotted this gorgeous and super soft lace sweater, I knew it was coming home with me. A close up of the ombre nails I am super proud of! Beige Lace Sweater – Bootlegger, I bought it on sale & can not longer find it on their site. 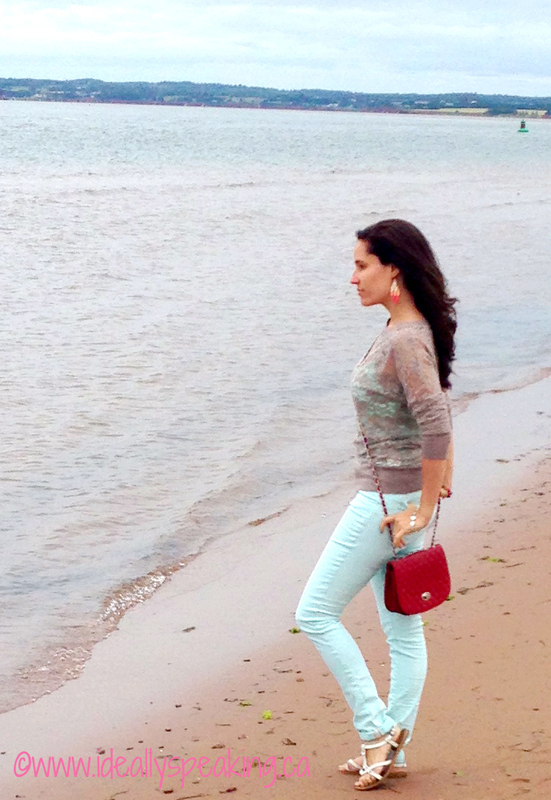 Red Quilted Chain Shoulder Bag – A little boutique in PEI. « #WordlessWednesday with Linky: Our Little Girl is 3!